WASHINGTON, D.C. -- Today, U.S. Rep. Harold "Hal" Rogers (Ky-05) applauded the unanimous decision by the U.S. House to pass H.R. 298, allowing for a feasibility study for the Mill Springs Battlefield located in Pulaski and Wayne Counties, to be included in the National Park System. "The Battle of Mill Springs is a source of great pride and interest to the people I serve," said Rogers. "Victory in the Battle of Mill Springs held off the Confederate advance into Kentucky, and laid the groundwork for later Union successes." In the early 1990s, the U.S. Department of Interior classified the site of the Battle of Mill Springs as one of the most endangered battlefields in Kentucky. After years of work preserving the historic site, the Mill Springs Battlefield Association expressed its desire to turn the site over to the National Park Service and the people of the United States for future generations to enjoy. "We have a great number of historical sites, which have been dutifully and faithfully preserved so that new generations can appreciate what this country has been through, and what their forefathers cared for," said Rogers. "The Mill Springs Battlefield is a jewel of this group of sites, and will be an excellent addition to the National Park Service." The bill gives the National Park Service three years to complete the study. It now moves to the U.S. Senate for consideration. 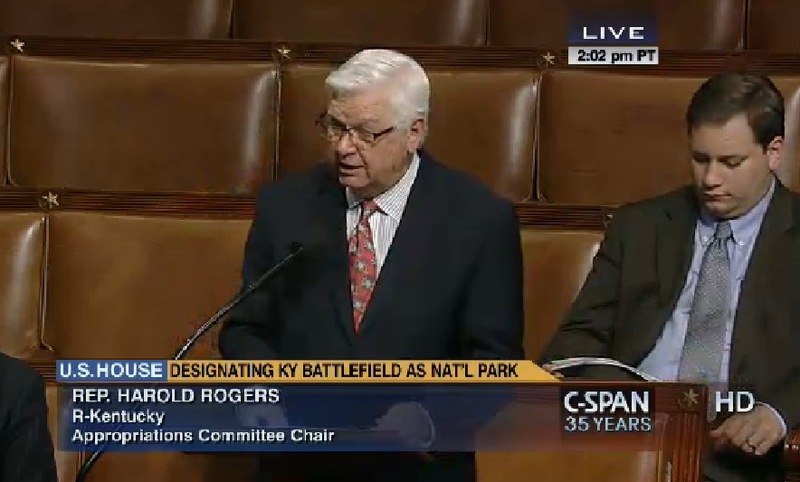 Rogers has served Kentucky’s 5th Congressional District since 1981. With a focus on economic development, job creation, fighting illegal drugs and preserving Appalachia’s natural treasures, he has a reputation for listening to his constituents and fighting for the region he represents. For more information, visit http://halrogers.house.gov/ or follow Rogers onTwitter or on Facebook.